An alkaline earth element, atomic no. 12, atomic wt. 24.3050, which oxidizes to magnesia; a bioelement, many salts have clinical applications. /mag·ne·si·um/ (Mg) (mag-ne´ze-um) a chemical element, at. no. 12; its salts are essential in nutrition, being required for the activity of many enzymes, especially those concerned with oxidative phosphorylation. Various salts, including m. chloride, m. gluceptate, m. gluconate, and m. lactate are used as electrolyte replenishers. magnesium citrate a saline laxative used for bowel evacuation before diagnostic procedures or surgery of the colon. magnesium hydroxide an antacid and laxative. magnesium oxide an antacid and laxative; also used as a preventative for hypomagnesemia and as a sorbent in pharmaceutical preparations. magnesium trisilicate a compound of magnesium oxide and silicon dioxide with varying proportions of water; an antacid. a silver-white mineral element. Its atomic number is 12; its atomic mass is 24.32. Magnesium occurs abundantly in nature, always in combination with other elements. It is obtained chiefly by the electrolysis of fused salts containing magnesium chloride or by the thermal reduction of magnesia and is used in photography, metallurgy, and various pharmaceuticals such as magnesium sulfate. Magnesium is the second most abundant cation of the intracellular fluids in the body. It is essential for many enzyme activities and the interaction of intracellular particles and binding of macromolecules to subcellular organelles, such as the binding of messenger ribonucleic acid to ribosomes. It also is important to neurochemical transmissions and muscular excitability. The body of the average 145-pound adult contains about 2000 mEq of magnesium, about 50% of which is in the bones, 45% existing as intracellular cations, and about 5% in the extracellular fluid. Absorption of magnesium occurs in the upper small bowel by means of an active process closely related to the transport system for calcium. Magnesium is excreted mainly by the kidney. 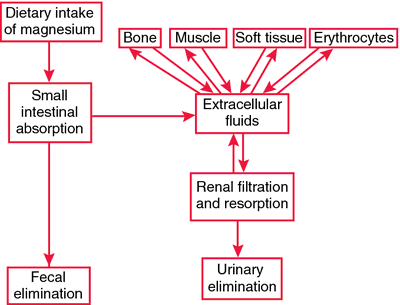 Renal excretion of magnesium increases during diuresis induced by ammonium chloride, glucose, and organic mercurials. Magnesium affects the central nervous, neuromuscular, and cardiovascular systems. Insufficient magnesium (hypomagnesemia) in extracellular fluid increases the release of acetylcholine and can cause changes in cardiac and skeletal muscle. Some of the conditions that can produce hypomagnesemia are diarrhea, steatorrhea, chronic alcoholism, and diabetes mellitus. Hypomagnesemia may occur in newborns and infants who are fed cow's milk or artificial formulas, apparently because of the high phosphate/magnesium ratio in such diets. Hypomagnesemia is often treated with parenteral fluids containing magnesium sulfate or magnesium chloride. Excess magnesium (hypermagnesemia) in the body can slow the heartbeat, and concentrations greater than 15 mEq/L can produce cardiac arrest in diastole. Excess magnesium also causes vasodilation by direct effects on the blood vessels and by ganglionic blockade. Hypermagnesemia is usually caused by renal insufficiency and is manifested by hypotension, electrocardiographic changes, muscle weakness, sedation, and a confused mental state. An alkaline earth element (atomic number 12; atomic weight 24.3) which is an essential mineral required for bone and tooth formation, nerve conduction and muscle contraction; it is required by many enzymes involved in carbohydrate, protein and nucleic acid metabolism. Magnesium is present in almonds, apples, dairy products, corn, figs, fresh leafy greens, legumes, nuts, seafood, seeds, soybeans, wheat germ and whole grains. Magnesium may be useful in treating anxiety, asthma and cardiovascular disease; it is thought to prevent blood clots, raise HDL-cholesterol, lower LDL-cholesterol, reduce arrhythmias and blood pressure, and to help with depression, fatigue, hyperactivity and migraines. Metabolism An alkaline earth–atomic number 12; atomic weight 24.3–intracellular cation and essential mineral required for bone and tooth formation; Mg2+ is bound to ATP, plays a pivotal role in neuromuscular activity, nerve conduction and signaling, muscle contraction; Mg2+ is a cofactor in enzymatic reactions in carbohydrate, protein, and nucleic acid metabolism, and is linked to the electrochemical properties of living systems ↑ in Renal failure, Addison's disease, magnesium infusion ↓ in DM, neuromuscular disease, ↑ Ca2+, ↑ K+, malabsorption syndromes, hyperparathyroidism. See Hypermagnesemia, Hypomagnesemia, Minerals. Cf Manganese. An alkaline earth element, atomic no. 12, atomic wt. 24.3050, which oxidizes to magnesia; a bioelement; many salts have clinical applications. element essential to the life of all body cells, being involved in many enzyme-catalysed processes. The concentration of ionized magnesium [Mg2+] in the body fluids is regulated at the correct level for normal excitability of muscle and nerve, including neuronal activity in the central nervous system. Magnesium is present in bone, and its metabolism is linked to that of calcium and phosphate. See also minerals; appendix 4.3 .
n an element/mineral found in nuts, seeds, grains, and green vegetables that has been used in reducing noise-induced hearing loss and in treating coronary artery disease, painful menstruation, the symptoms of PMS, migraines, high blood pressure, autism and preeclampsia. Magnesium supplementation may also be needed in patients taking cisplatin, cyclosporin, or loop and thiazide diuretics. Caution is advised for children and patients taking sulfonylurea-based antidiabetic medi-cations or potassium-sparing diuretics. An alkaline earth element, which oxidizes to magnesia; a bioelement, many salts have clinical applications. n an elemental metal with an atomic weight of 24.32. Magnesium is an essential nutritional substance. Deficiency produces irritability of the nervous system and trophic disturbances. n a salt of magnesium; also called Epsom salts, used as a therapeutic bath and as a purgative. Q. What's the best way to get more Magnesium in my diet (not pill supplements)? I am 28 years old and I am having several health issues. I am very much sensitive to noise and could not sleep even if there is a small sound. It really puts me down and I just cannot go in traffic. I get nervous if I hear a horn or siren. I do panic if I see few vehicles overtake mine and I am undergoing great stress. I am confused even while looking at menu card in the restaurant and I am feeling that my muscles are weak. I did several researches and even consulted few doctors. I did recently discover that magnesium deficiency may be causing/aggravating my situation. What's the best way to get more Magnesium in my diet (not pill supplements)? A. Green vegetables such as spinach are good sources of magnesium because the center of the chlorophyll molecule (which gives green vegetables their color) contains magnesium. Some beans, peas, nuts, seeds, and whole, unrefined grains are also good sources of magnesium. A two-way analysis of variance (ANOVA) for repeated measurements with time (within-subject variable) and AF development (between-subject variable) as factors was used to compare groups with or without AF with regard to tissue and blood magnesium levels throughout the study period. However, when all patients were considered, CPB was associated with a high mean blood magnesium level compared to baseline (p=0. Postoperative changes in blood magnesium levels in patients with or without AF are shown in Figure 2. In this study, no significant difference was detected between patients with or without AF with regard to blood magnesium levels during early postoperative period. 52) Intriguingly, none of the patients had detectably low blood magnesium at the study's outset, suggesting that it's possible to be total-body deficient in magnesium, while still maintaining normal blood levels. 7) Many experts now believe that blood magnesium should be checked whenever testing of other electrolytes (chemical ions) in the blood is done.